I am super excited to be featuring this book today! Debbie’s stories and illustrations are so much fun and I’m so grateful to have her as one of my writing buddies. For me, starting a new year always jump starts my creativity and this book definitely inspires creative thinking! It also reminds me of an art-related game my mom used to play with me and my daughters to pass the time, where we took turns adding onto the same drawing. Sam & Eva was written and illustrated by Debbie Ridpath Ohi. It was published by Simon & Schuster in 2017. Sam had just begun to draw when Eva arrived. Specific word choices help to bring out the character’s personalities in this story. You can really see how 'every word counts.' As a mentor text, this is a great example of how to create an engaging story with minimal words. I especially love the page where the characters’ ideas really start to flourish: Marmot was actually a superhero in disguise. I love to read this story to my kindergarten students to encourage them to tell stories using their drawings (except we can’t draw on the walls, as one boy in my class pointed out). Although I haven't suggested this, it would also be a fun story to practice retelling and I think I might try that the next time I read it with my students. They love retelling stories! The expressions on the character’s faces are great for talking about emotions. This book is also perfect for starting a discussion about what it means to cooperate. Draw: Play a drawing game with a friend. Take turns adding new parts to a drawing. What did you end up with? Build a story: Make four small drawings of different items on small pieces of paper or index cards. Have a friend do the same. Swap your drawings with a friend and then write or dictate a story to link the four drawings together. 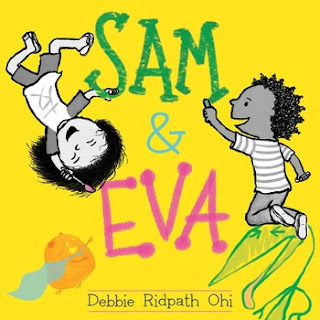 Create Art: Work with two different kinds of drawing tools the way Sam and Eva do in the story. Try paints and crayon, paint and chalk or paints and pastels. What happens? What effects can you create? Think: At the end of the story, Eva has drawn a triceratops and Sam thinks it’s a unicorn. What happens next? Draw a picture to show your idea. I love this story about teamwork. Important to start teaching teamwork/working together to kids at a young age. Love the illustrations! Great activities! and I agree - the expressions on the kids' faces are so fun. I totally enjoyed this book, too.